Happy December, friends! How is it here already? The weather in LA had a sudden change and I can’t help but get all giddy over the Christmas spirit, the lights and decorations always get me! Given that it’s been a little cold and crisp lately, I’ve been wearing this Margaret O’Leary sweater on repeat. 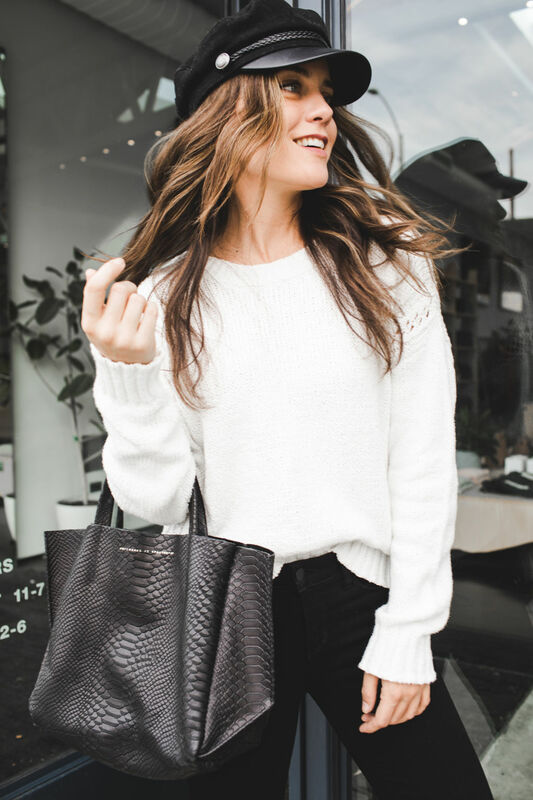 If you haven’t already, this is the perfect time to visit their website (or visit one of their beautiful stores) and stock up on knits that will last you a lifetime – which also make a great gift for the women in your life. I promise you their quality and style never disappoint! Jeff and I are headed to Italy in two weeks and I can’t wait to bring my favorite MOL sweaters with me, carefully selecting the oversized styles so I can eat all the pasta and drink all the wine if you know what I mean haha. I hope you stay cozy and warm surrounded by your loved ones. Let me know where you’re spending the Holidays in the comments below. I’ll be sending you all my love from Roma!